August 19, 2015--Stitched the border on the second set of coasters--a gingham pattern in black. Love how well the technique is working. The below pictures show front and back of two coasters. Next step--stitching the cute pumpkins. 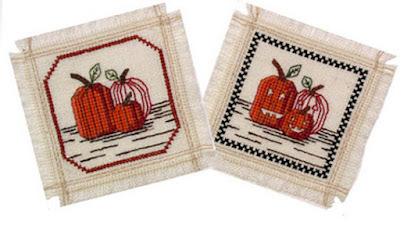 August 9, 2015--Signed up to take Catherine Jordan's online class through the Shining Needle Society (SNS) called Reversible Cross Stitch Pumpkin Coasters (project photo below). 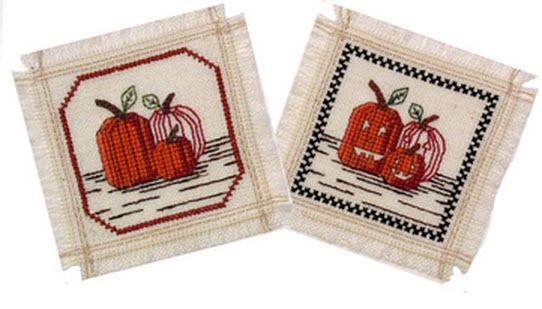 There are four coasters to stitch with floss, in two different patterns, on Zweigart Biella 28 count fabric. Yesterday I began to stitch the outline of one of the designs and discovered early on that I had to increase the magnification of my glasses. Doing so made a tremendous difference in the quality of my stitches. The technique learned is a challenge, requiring full attention to each stitch. Catherine's instructions, however, are wonderful and she even included a password to access a special online, very, very helpful, video to see how the stitches were done. I also had to zigzag the edges to keep the fabric from unraveling. Why zigzag using red thread? It's what was on my sewing machine and I was too lazy (lol) to change the thread. The whole idea of the technique I'm learning is for the cross stitches to look the same on the front and back. I've somewhat succeeded with doing this, but hiding beginning and ending threads is still a bit of a challenge for me. The idea is to NOT have the tails showing under the cross stitches on either side. Getting there. I really wanted to learn this technique, but didn't feel inspired by the Halloween theme. I hope Catherine runs another class like this.